We have released a chart control which supports Google Charts API’s. As we all know, Charts can be used to represent large quantities of data and the relationships between parts of the data. To bring this functionality to our users, we have come up with the Wolf Chart Control, which is a point-and-click interface that helps you to visually represent the data of your Wolf SaaS Application. 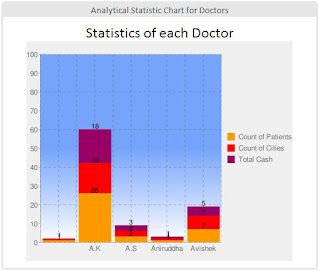 “Charts have been the most requested feature from our existing customers and we are happy to release the functionality. We see a growing demand for Business-Analytics-as-a-Service and will now be able to help our customers in developing visually rich SaaS application rapidly using our new charting control and advanced technical code free Business Rules Engine" said Mr. Ralph Vaz, Founder & CTO WOLF Frameworks. What kind of Charts can be build using Wolf Chart Designer? Wolf Development Team is working to add more to this list, which means more options to represent your data. What if I had made a line chart with Wolf Chart control and want to change it to other type of chart? Just select the type of chart again in the chart control, and publish. 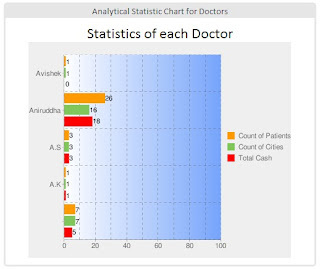 A new type of chart with same statistics is ready in one click. How much time does it take to configure a chart using Wolf Chart Control? Not more than 5 minutes…or till your coffee lasts!! What is the core process working behind the Wolf Chart Generation? Wolf Business Rule Engine and Google Chart API's are the backbone and core processes behind the chart generation. So the robustness of the chart is unquestionable. In the background, how does the Wolf Chart Control works? We have wrapped the Google Chart API call with our Wolf Chart Control. As soon as you configure your chart in Wolf Designer and publish it, our Chart control makes a call to Google Chart API to create an image of the chart with the data from the selected data source while configuring the chart. And it sends back the chart image to your application. How secure is data using Google API in this manner? The data sent is in encrypted form using any of the three types of encoding depending upon the type of chart: Simple Text Encoding, Text encoding with data scaling, Extended encoding. 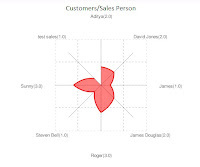 How did you manage to get the data dynamically for chart generation? The backbone of Wolf PaaS are XML and the Business Rule Engine. And these work, at their best, in extracting data from the Database and performing operations on it. First of all the data is extracted from the database in the XML format after performing the operation defined in the Business rule. Then that XML data is tranformed into the source for the chart using the XSLT tranformation. In this way, our Business Rule Engine and XML/XSLT technology has made our task easy while extracting the data dynamically. How many charts can I make using Wolf Chart Control for my Wolf SaaS application? Virtually there is no limit of charts that can be built using Wolf Chart Control, but Google Chart API has a restriction of 250,000 calls per day, if you can reach this limit in a day for your application.